Becoming a Woman in the Age of Enlightenment: French Art from The Horvitz Collection was primarily an exhibition of drawings, but included pastels, paintings and sculptures selected from one of the world’s best private collections of French drawings. 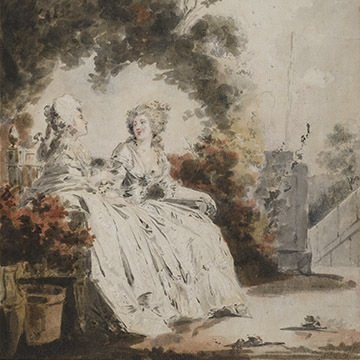 The exhibition featured more than 150 works by many of the most prominent artists of the eighteenth and early nineteenth-century, including Antoine Watteau, Nicolas Lancret, François Boucher, Jean-Honoré Fragonard, as well as lesser-known artists both male and female, such as Anne Vallayer-Coster, Gabrielle Capet, François-André Vincent, Philibert-Louis Debucourt. Ranging from spirited, improvisational sketches and figural studies, to highly finished drawings of exquisite beauty, the works included in the exhibition varied in terms of style, genre and period. Becoming a Woman was organized into thematic sections that addressed some of the most important and defining questions of women’s lives in the eighteenth century. These included: how the stages of a woman's life were measured; what cultural attitudes and conditions in France shaped how women were defined; what significant relations women formed with men; what social and familial rituals gave order to their lives; what pleasures they pursued; and what work they accomplished. The aim was to bring new insights to the questions of what it meant to be a woman in this period, by offering the first exhibition to focus specifically on representations of women of a broad range of ages and conditions. The exhibition offered fresh perspectives on a subject that still has direct relevance to our times, but that had not been the focus of a significant exhibition for decades. Through its conceptual framework, thematic organization and its emphasis on historical context, the exhibition provided viewers opportunities to consider what issues pertaining to women’s lives seem to have changed or persisted through time and across space. Although the circumstances and the specifics have changed, many issues remain with us today and can still provoke contentious debates. Pay equity, reproductive rights, gender-discrimination, violence against women, work-family balance, the ‘plight’ of the alpha-female, and the devaluation of the stay-at-home mom, are but a few of the women’s issues that are still hotly contested in the media, in cultural production of all kinds, in politics, and in public and private life. Becoming a Woman was curated by Melissa Hyde, Professor of Art History and Research Foundation Professor, University of Florida, and the late Mary D. Sheriff, W.R. Kenan J. Distinguished Professor of Art History, University of North Carolina, Chapel Hill, and was organized by Alvin L. Clark, Jr, Curator, The Horvitz Collection and The J.E. Horvitz Research Curator, Harvard Art Museums/Fogg. An illustrated catalogue accompanying the exhibition was available for purchase in the Museum Store. This exhibition was made possible by the generous support of the Londono Family Endowment, the C. Frederick & Aase B. Thompson Foundation, Dr. M. F. Smith and Mr. Carl E. Wisler, Marcia Issacson, Kenneth and Laura Berns and Visit Florida with additional support from the Harn Program Fund and a group of women in the UF community. This is a free, three-part film series to be screened by Films Under the Stars in conjunction with the exhibition Becoming A Woman in the Age of Enlightenment: French Art from The Horvitz Collection. Screenings will be held outside at the UF College of the Arts, Fine Arts Plaza on the UF campus. Bring your own blankets and chairs! Visit the facebook event. Sylvia Milo’s one-woman theatrical piece, “The Other Mozart” tells Nannerl Mozart’s story. A prodigy, keyboard virtuoso, and composer, she performed throughout Europe with her brother to equal acclaim, but her work has been lost to history. Learn more and purchase tickets here.